NEW BERLIN, IL – Born of pure imagination, the mystical Skwerdlock arrived out of nowhere early one morning about 45 years ago, and has been living in the heart of Pops Jamison’s daughter Tricia ever since, helping kids see their potential with silly stories and rhyming. Now, the Skwerdlock is being introduced to readers in a fun series. In the first book, Meet the Skwerdlock, Trish introduces young readers to the elephant-eared, hog-nosed Skwerdlock. Their adventures continue in I Saw the Skwerdlock with rhyming and more of Skwerdlock’s silliness. 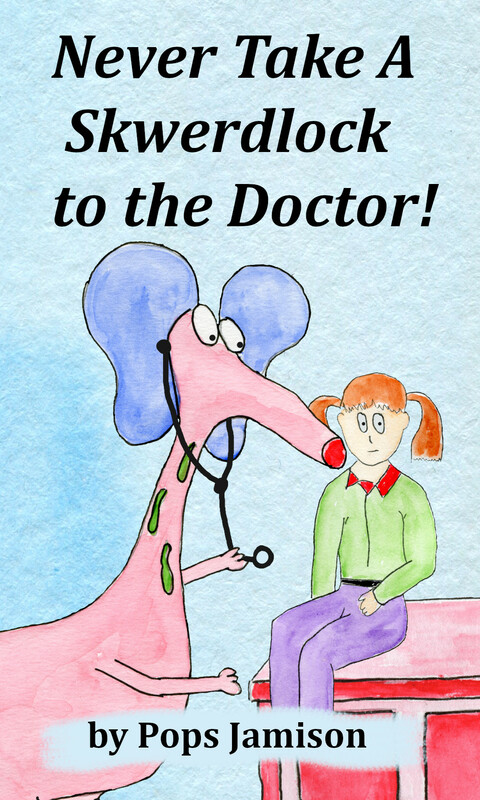 A new adventure, Never Take A Skwerdlock To the Doctor, is arriving this spring from ImagiLearning, Inc. Pops created the Skwerdlock Series to help spark a love of books, teach a few new words, and have a good excuse for parents and kids to sit in the recliner and enjoy time together. When school becomes too serious and reading is more of chore, Pops encourages kids to pursue creative outlets. The illustrations in the book — created by Pops himself — teach kids that the stories they create are beautiful, no grades or expectations necessary and that you don’t have to be able to draw a perfect apple to be an artist. Pops Jamison | March 3, 2018 | ImagiLearning, Inc. Pops Jamison | September 1, 2018 | ImagiLearning, Inc. Pops Jamison | pub date | ImagiLearning, Inc.
John Jamison is a life-long believer in the power of stories. First as a pastor, then educator, creator of Centers for Innovation at multiple universities, Director of a national Game and Simulation academic degree program, a consultant for e-learning and brand development, John has used the power of story to bring about serious change and have some fun in the process. John grew-up in a small river-town in Illinois, and describes his childhood as “kind of Tom Sawyer-ish with a blend of Wizard of Oz.” John says, “I grew up in a family of storytellers and liars, and I spent most of my time trying to figure out which was which.” Keep up to date with his books at https://jbjamison.jamisonbooks.com/. You are also the author of the Emily Graham thriller series. What made you decide to start writing children’s books as well? I have always enjoyed storytelling with children whenever my career has offered me the opportunity to do that. But I think the decision to start writing came from watching my two grandchildren develop a love of stories and books, but then seeing that love get dents all over it when going to school turned reading into something that was graded and measured by points and posters on the wall. Reading was no longer just a wonderful, imaginative adventure, but was now something that separated the students who won the free pizzas and stickers from those who did not. Instead of just being a reader, now children were a “good” reader, or “fair” reader, or “slow” reader. It was like I saw a light going out in their eyes. I am an educator and fully support education, but I wonder if we might find ways to educate without denting the magic? So, I write my stories to be as difficult to “grade” as possible, but very easy to feed a smile or a laugh. My books are an escape; an opportunity to read just for the fun of reading, and opportunity to dream about a future not defined by a ranking. What is the most important lesson you hope to impart in the Skwerdlock books? Imagination is a wonderful thing. In my mind, there is far too much emphasis put on making sense and having correct answers to questions. Reading starts out to be fun imagination time, but then we end up in school having to take tests about what we read. Imagination and dreams are far more important than checking the correct box. With a strong imagination we create the future. Without that imagination we just keep recreating the past. In my imagination my readers are going to dream of some amazing things they will go on to create. Where does the Skwerdlock’s name come from? I was sitting in the rocking chair at two in the morning holding my very sick infant daughter. She seemed to calm down if I hummed and my humming turned into a song. The song began, “Oh, I wish I had a Skwerdlock, a funny looking dog…”. I wasn’t thinking about what I was singing, but just happy to see my daughter relaxing. The Skwerdlock just showed up and told us his name when he walked in. How does your writing process change when you are writing thriller/suspense versus children’s books? My writing process is essentially the same. My first step for either genre is to allow an idea to ferment in my mind until it comes to the point where it becomes “real” to me. Once it is real, all I need to do is sit down, watch the story unfold, and write down what I see and hear. It’s the same for both. My children’s books are shorter, but I have to be more careful with language since my young readers can be so literal at times. I can use fewer words and let the illustrations do their part. Fewer words means less time spent editing, but more time picking and choosing the absolute best word to spark the synapses. But the actual writing itself process is pretty much the same. Describe the artwork that you included in the book and why you chose to illustrate it yourself. Amateurish, and intentionally so. I love really nice, professional illustrations. I also know that I don’t have the skills to create that kind of illustration. However, that does not mean I can’t tell a story and create a book. My goal is to create just enough of a picture that my reader’s imagination can go ahead and finish it, so they end up seeing their picture instead of mine. Maybe, if I am lucky, my illustrations will remove some of the “I can’t” I’ve heard children express and have them say instead, “Heck, if HE can do it, so can I!” As for why I chose to illustrate the books myself? The Skwerdlock made me do it. Did the Skwerdlock spring forth fully formed from your imagination fully formed, or was he pieced together a little at a time? The Skwerdlock just showed up in the middle of the night almost 40 years ago, and we have sung and talked about him ever since. But it wasn’t until a year ago when I decided to try and write the first book that I actually sat down and figured out what he looked like. It was all in the words of the song, but I had never actually tried to visualize it. I picked up a pencil and started sketching; ears like an elephant, neck like a giraffe, and all the rest. At one point I just put my pencil down and stared. There he was!